A blog for our family, be ye a Christensen or Hines, etc. My father used to sing a song for me. Soon I would giggle, as he grinned at me. When I was not more than a tadpole, of three. My heart does not grieve. Idaho and Spuds. Need I say more? My mom was gracious enough to come with me to Blackfoot, ID while I got my car fixed. We did our typical Walmart shopping and checked out the $ store. Then we had to try the new Jr. Banana Splits at Sonic. They were very yummy and very tiny. Perfect snack size. When we got done with everything we were going to do my car still wasn't done. So what else is there to do in Blackfoot? Why check out the world famous potato museum of course! Now that's a big potato! We had to check out the gorgeous potato fashions. Hopefully no one outside of the museum is sporting these styles although Marilyn makes a potato sack look good! There was a lot of spud machinery on display. I had to take a picture of the horsies for my Carlee. And the trains for Mr. Collin. They had a whole cabinet devoted to just potato mashers. Very colorful spuds. Collin thought these were weird. I was going to take a bite out of him but thought better of it. Collin was looking at these pictures while I was downloading them and now he wants to go see the huge potato out front! 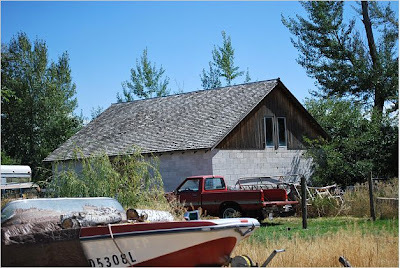 A walk down memory lane happened September 6, 2008 with a visit to Ucon, Idaho. 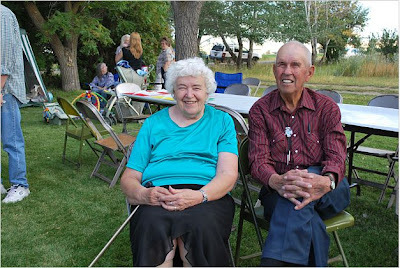 The event the Rasmussen family reunion. Rhonda, Kami, Collin and Carlee and myself were able to see the home where I spent most of my youth and my grandparents home and farm. The visit brought back many memories. Many changes were noticed both in Ucon itself and the farm. Many streets and subdivisions have been added to Ucon itself. Open fields used to separate lower Ucon from the schools and church. Now, new homes fill in the gaps. Most of the older homes have been upgraded with siding and trees. Old fields that served as play grounds for a variety of activities no longer exist. New occupants now live in many of the homes. Their former occupants have moved or passed on but memories of their contributions to the community and friendships linger on. This is my old home. We lived in the basement for a couple of years. Later, the upstairs and garage was added. We planted most of the existing trees and shrubs. The front lawn was also added with a large flower garden located to the left of the driveway. In the backyard, a garden was planted on the left hand side of the lot. Fruit trees were added to the right side and middle of the back. 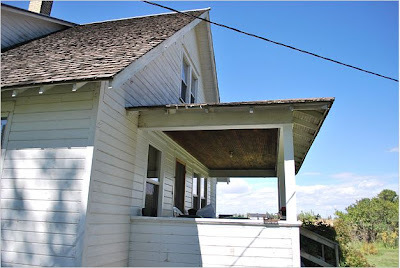 The house used to have a fake white brick siding and was trimmed with a light green paint. 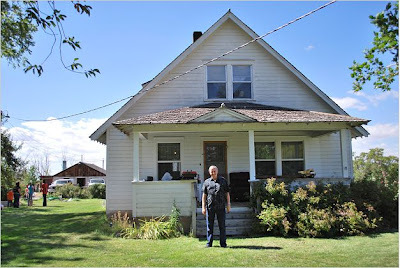 This is the south side of my grandpa Rasmussen's home on the farm. 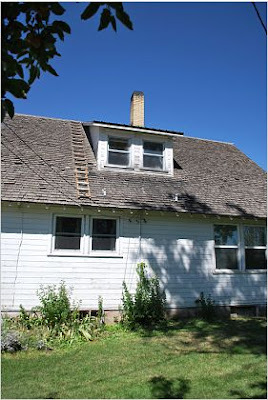 While, working there during the summers, I occupied the upstairs room on the left. A wall separated the two windows. The window on the right actually was located in a closet. The lower widows to the left are to the kitchen and the left windows are to the dinning room. Their used to be a flower garden running the full length of the house. Pictured here is the south front side of the house. The upper windows are centered in the large front bedroom. Below the windows is a font porch . This is the front of grandpa and grandma's home. To the rear left the old milk barn can be seen. This is the old grainary located left of the milk barn. 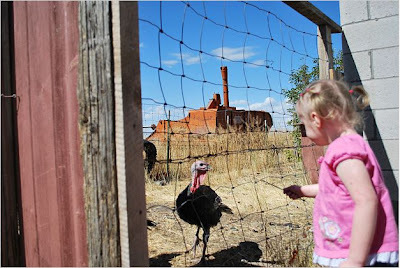 Here's Carlee with a turkey. The orange machinery in the background is the old grain combine. This is Uncle Neil's chickens. Mom and dad are relaxing under the shade trees. Collin is hooping it up. Carlee is sneaking into the prize tent behind Aunt Connie. This is part of the old hay wagon. 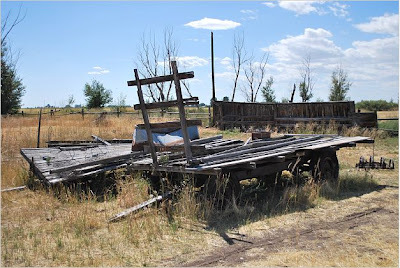 This is a larger view of the old hay wagons. The old east west tree line remanents that used to run the full length of the farm. This is looking toward the south side of the house. This is part of the old cow corral. The front piece of machinery is a grain drill and the back is the combine. This machinery was used to remove potato vines prior to harvesting. Carlee wrapped up in a cloth snake. Wayne and Isabel preparing food for the reunion. In th background is cousin Elaine. Scott visits with Wayne and Isabel. Uncles and Aunts get together. Kami gets captured on film. Collin plays with kittens with his cousins. Carlee below discovers crabapples. Introduction to Our New Blog! We thought it would be fun to have a community family blog!! You can all be a part of this blog and add content whenever you want. It will be a good way to communicate with each other, add personal or family histories, stories, pictures, news, rants, raves, events in our lives, or whatever your heart desires! You can blog anytime! To join, just send an email to Joe or Rhonda, and you will be added as a contributer to this blog. Come on everyone!! It will be fun!! This song really moved me today. I am a cub scouter! !